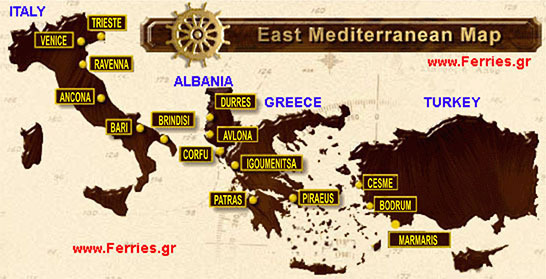 Paleologos S.A. | All Greek Ferries routes from/to Italy Greece Albania Turkey and Greek islands. Ferries in Greece. Sea Travel Ferries to Greek islands. Greek Hotels, Car rental in Greece, Cruises in Greece. Greek Ferries/Boat/Ship schedules for Greece + Greek Islands - Greek Ferries Info. The "Paleologos Shipping Agency" was established in 1946 in Heraklion (Iraklion), Crete and became soon one of the biggest and more responsible shipping agencies in the island. We offer our services with reliable and consistent knowledge. Our commitment to serve our customers is based on a long-life experience and a successful cooperation with shipping companies, all over the world. Our Agencies include loading and discharging of tankers, general cargo, R0 - R0, container ships and any requirement that owners or charterers might have. Passengers and Vehicles must report at the embarkation port for check-in at least one (1) hour before departure. The ticket is strictly personal. It is not transferable and is valid only for the specific accommodation and route that has been issued for. Tickets can be cancelled only at Paleologos Travel Agency or at the specific shipping company's central/port office. They cannot be cancelled over the phone and their owners should deliver them to the agency of issue. After departure, tickets are neither cancelled nor reverted to open and the date of travel cannot be changed. - Up to 14 days before departure date: 100% refund on tickets value. - Up to 7 days before departure date: 75% refund on tickets value. - Up to 12 hours before departure date: 50% refund on tickets value. - Cancellations made in less than 12 hours before departure are NOT entitled to a refund. - Alternatively tickets can be converted to open date tickets or for another departure date till one hour before the departure. -100% Cancellation up to 14 days prior to departure. - 75% Cancellation up to 7 days prior to departure. - 50% Cancellation up to 12 hours prior to departure. - No refund from 12 hours until departure. - Tickets can be changed to open status 4 hrs prior to departure. - Tickets made open can be replaced up to one year after their issuance date, and only once. Open tickets are valid and can be used for one year after their first date of issue. - Up to 14 days prior to departure: Tickets are cancelled without charge or can be converted to open date tickets or for another departure date. - From 13 days and up to 7 days prior to departure: A 25% cancellation charge is applies of alternatively tickets can be converted to open date tickets or for another departure date. - From 6 days and up to 4 hours prior to departure: A 50% cancellation charge is applied or alternatively tickets can be converted to open date tickets or for another departure date. - 4 hours prior and up to the departure: 50% cancellation charge is applied and the tickets cannot be converted to open date tickets or for another departure date. - After departure: Tickets cannot be cancelled or converted to open date tickets or for another departure date. - Up to 4 hours prior to departure: Tickets are cancelled without charge or can be converted to open date tickets or for another departure date. - From 3 hours and up to 1 hour prior to departure: A 50% cancellation charge is applied or alternatively tickets can be converted to open date tickets or for another departure date. - 1 hour prior and up to the departure: 50% cancellation charge is applied and the tickets cannot be converted to open date tickets or for another departure date. or can be converted to open date tickets or for another departure date. tickets or for another departure date. can be converted to open date tickets or for another departure date. - A 100% refund, up to 22 days prior to departure. - A 80% refund, from 21 days up to 8 days prior to departure. - A 50% refund, from 7 days to 24 hours prior to departure. - The Company has no obligation to refund in case of cancellations made less than 24 hours prior to ship’s departure or if the passenger does not report at check-in. After ticket issue, reservation cannot be cancelled but can be changed by paying the resulting price difference (the offer is not valid when changes occur). * Valid for all accommodation and private vehicle categories. * Discount is cumulative with all other offers/discounts provided by the ferry line. 7 days prior to departure: Tickets are cancelled without charge or can be converted to open date tickets or for another departure date. From 7 days and up to 4 hours prior to departure: A 50% cancellation charge is applied or alternatively tickets can be converted to open date tickets or for another departure date. 4 hours prior and up to the departure: 50% cancellation fees must be paid. After departure: Tickets cannot be cancelled or converted to open date tickets or to travel another date. For the period 22/04/16-30/04/16 & from 16/06/16-18/06/16 for all departures from Piraeus or Rafina and for the period 01/05/16-08/05/16 & 20/06/16-21/06/16 for all departures to Piraeus or Rafina, tickets are cancelled without charge or converted to open date tickets or for another departure date, 14 days prior to departure. From 14 days and up to 7 days prior to departure, a 25% cancellation charge is applied or alternatively tickets can be converted to open date tickets or for another departure date. 3 days prior to departure: Tickets are cancelled without charge or can be converted to open date tickets or for another departure date. 1 hour prior and up to the departure: 50% cancellation fees must be paid. OPEN DATE TICKETS:Open date tickets are cancelled without charge when they have been originally issued as open date. If they have been converted to open date, a 50% cancellation fee applies. - From the date of issue of the ticket until 8 days before the scheduled time of departure tickets can be cancelled without cancellation penalties if the whole body of the ticket is returned or they can be converted to open date tickets. - From 7 days up until the scheduled time of departure tickets can be cancelled with a cancellation penalty of 50% as long as the whole body of the ticket is returned or alternatively, they can be converted to open date tickets. - In the case that a ticket is cancelled within a period of seven (7) days to one (1) hour prior to the vessel's scheduled date and time of departure, a refund of 50% on the fare is granted. - From fourteen (14) days up to seven (7) days prior to the vessel's scheduled date and time of departure, a refund of 75% on the fare is granted. - Alternatively, the passenger is given the possibility to convert these tickets into Open Date (Open) in order to use them on a future trip, provided that the request has been made before departure. - Up to 6 days before departure: 100% refund or change to open date ticket. - From 6 days up to 12 hours before departure: 50% refund or change to open date ticket. - From 12 hours before departure to upon departure time: 50% cancellation fee. Open date tickets are valid for one year from the issuing date. Open date tickets are not valid for embarkation unless replaced by new tickets with the date of departure. - Tickets can be changed to open date tickets at least 24 hours before departure. Open date tickets can be replaced with tickets for another date for any of our destinations (subject to availability). They are valid for one year, they cannot be cancelled and any price difference is not refunded. - For cancellations made in less than 12 hours before departure fare CANNOT be refunded. - Up to 2 hours before departure, on the Saronic Gulf and Sporades lines (excluding high-speed vessels in Piraeus - Aegina - Agistri – Piraeus line and Saronic Gulf ferries where the conversion can be done before departure). Open-Date are replaced with new tickets of equal or greater value by paying the difference in fare, if seats are available for the same or another trip. For this new ticket the above cancellation terms are not valid; any fare difference from the original is not returned. Naturally, the new ticket may not be of discount if the older was not, and a vehicle ticket is not replaced with a passenger ticket or vice versa. Open tickets are valid (can be replaced with a new ticket) up to the end of the year of issue of the original ticket. Offer Tickets (22,00 €) can not be canceled. Passengers who plan ahead and purchase their tickets up to 15 days earlier than their departure date enjoy a 15% discount, offered by our Early Booking Program. The offer is valid for a limited number of seats, from Tuesday to Thursday. The offer is valid for a limited number of seats with the simultaneous booking and issuing of tickets. These tickets cannot be cancelled or refunded, but they can be changed into Open and replaced by the end of the year with new tickets by just paying the regular price difference. * The above offer is not valid for the Saronic itineraries. - There is a choice of changing the tickets into Open Dated tickets in order for them to be used for another trip. - The Open Date tickets are replaced by a new ticket, of the same or bigger value, by paying the difference upon availability for the same or different trip. For this new ticket all the above cancellation terms are not valid and any difference in price is not refunded. Please note that the new ticket cannot be issued with any discount if the initial ticket did not have a discount and vehicle tickets cannot be replaced by passenger tickets and vice versa. Open tickets (may be replaced) are valid until the end of the year that the initial ticket had been issued for. - From the date of the ticket issue and up to 14 days before the scheduled departure, the fare of the ticket is fully refundable. - From 13 days up to 7 days before the scheduled departure: 75% refund. - From 6 days up to 12 hours before the scheduled departure: 50% refund. - From the date of the ticket issue and up to 30 days before the scheduled departure, the fare of the ticket is fully refundable. - From 29 days up to 7 days before the scheduled departure: 75% refund. - From 6 days up to 24 hours before the scheduled departure: 50% refund. - On the day of the scheduled departure: the fare is not refunded. - Tickets can be refunded only by the issuing agency. - We would like to inform you that as of 29/5/2016 and after information received from the Ministry Of Mercantile Marine and Island Policy as well as the Port Treasury Committee of the SouthEast Aegean Islands in the Line between Fethiye and Rhodes it is also I effect the article No 20 of Law 3622/2007 as published at the National Gazette No 281 / A of 20.12.2007 consequently all passengers will be charged € 6 per person including the special ISPS - Charge Port Tax. - For cancellations made in less than 12 hours before the departure no refund can be made. - Tickets can also be converted to open date tickets (open) at least 24 hours before departure. Open date tickets can be replaced with another date tickets for any route subject to availability (valid for one year and it can not be canceled, the fare is non-refundable). The Company has no obligation to refund in case of cancellations made less than 24 hours prior to ship’s departure or if the passenger does not report at check-in. - A 100% refund, up to 91 days prior to departure. - A 80% refund, from 90 days up to 8 days prior to departure. The company has no obligation to refund in case of cancellations made less than 24 hours prior to ship's departure or if the passenger does not report at check-in. 1) Tickets are cancelled without cancellation fees or reverted to OPEN at least 5 days prior to departure. 2) Five (5) Days up to 12 hours prior to departure tickets are cancelled with 50 % cancellation fees or reverted to OPEN / OTHER DATE. 1) Tickets are cancelled without cancellation fees or reverted to open 3 days prior to departure. 2) Three (3) Days up to One (1) day prior to departure tickets are cancelled with 50 % cancellation fees or reverted to OPEN / OTHER DATE (at least 2 hours prior to departure). Β) If you have the tickets in hands, you ought to return them to us. The new tickets can either be sent to you if you agree to pay the delivery cost again or we can arrange for you to collect them at the port office on the departure day free of charge. * Printing of Tickets, and the provision of services at the request of passengers (modifications, alterations, upgrades, etc.) may lead to additional charge from the Central Agents. Central-Port agencies are individual private entities, and Paleologos S.A. bears no responsibility for any pricing & service charge. 1) State the loss by writing to Paleologos S.A.
2) In order to travel, it will be necessary to purchase new tickets. Provided that, by the end of the year the Shipping Company audit files show that the ticket(s) have not been used you are eligible either for a refund or a new ticket of equal value. This condition depends on the ferry company. The shipping companies reserve the right to substitute the vessel for which the ticket was issued upon approval from the Ministry of Merchant Marine. Furthermore, our company should be informed by any passenger who needs SPECIAL CARE, upon the issuance of the relevant ticket. It is pointed out that the issuance of tickets on board is strictly prohibited. Therefore, for convenience reasons as well, the booking and issuance of tickets should be affected always on time. The fares include sea passage in selected accommodation and all port charges (for Domestic lines only). Meals and beverages are not included. All discounts are not cumulative and only the highest discount is granted at a time, when applicable conditions are met. Passengers entitled to discounted fares are kindly requested to state it at the time of booking and carry with them all the necessary proof documents during the tickets issue as well as the check-in procedure. Once the ticket is issued, no refunds are provided for price differences. Children under the age of 5 (infants) travel free of charge and exclusively on DECK accommodation category in Conventional ferries. In other type of accommodations (e.g. cabins) are entitled to 50% discount (children's fare). They also travel free of charge in all accommodation categories in High Speed vessels. Children 5-10 years old benefit with 50% reduction of the total fare, in all accommodation categories, in Conventional and High Speed vessels. Only Greek public universities students are entitled to student's discount. Neither the Shipping Companies nor the ships are liable for any accident, loss or damage occurring prior to boarding, during loading and after disembarkation. According to the High Speed code safety regulations, passengers are not allowed to stay at any open area of the High Speed vessels during the sailing. Luggage may be left inside vehicles. Passengers are kindly requested to take their personal belongings that may use during the voyage. Access to the ship garage during the voyage is prohibited. The Shipping Companies shall not be held liable in case of loss of money or valuables stored in cars, luggage, common areas or cabins. Passengers are welcome to check cash and valuables with the Purser's office for safekeeping. Pets travel either in kennels or in pet cabins. They are not allowed in indoor public areas. Pet owners are responsible for feeding and pet hygiene. Pet owners are required to have their pet's valid health papers with them. Passengers ought to comply with the captain and crew instructions regarding public order and safety on board. after the end of the journey. - Kindly be informed that, this on-line booking system is linked to all Shipping Companies and appears their OFFICIAL SCHEDULES. - Non available and unpublished schedules DO NOT APPEAR HERE. - Booking is made in REAL TIME. Aegean Speed Lines Piraeus ( Athens) - Serifos - Sifnos - Milos - Santorini ( Thira ) - Paros - Naxos - Folegandros or v.v..
Agoudimos Lines Rafina ( Athens) - Andros - Tinos - Mykonos or v.v..
Alpha Ferries Rafina ( Athens) - Andros - Tinos - Mykonos - Naxos - Paros or v.v..
Anek Lines Piraeus ( Athens ) - Crete ( Heraklio - Rethymno - Chania ) or v.v..
Anen Lines Kisamos ( Crete - Chania ) - Kythira - Antikythira - Gythio - Kalamata - Piraeus (Athens) or v.v..
Anes Ferries Symi - Rhodes - Kalymnos - Kos - Nissyros - Tilos - Kastelorizo - Panormitis or v.v..
Blue Star Ferries Piraeus ( Athens ) - Patmos - Leros - Kos - Katapola ( Amorgos ) - Rodos ( Rhodes ) - Naxos - Thira ( Santorini ) - Ios - Paros - Syros - Tinos - Mykonos or v.v..
Piraeus ( Athens ) - Chania (Crete) or v.v. Rafina ( Athens ) - Andros - Tinos - Mykonos - Paros or v.v..
Cyclades Fast Ferries Rafina ( Athens ) - Andros - Tinos - Mykonos or v.v..
Dodekanissos Rodos ( Rhodes ) - Kos - Kalymnos - Leros - Lipsi - Patmos or v.v..
Euroseas Piraeus ( Athens ) - Poros - Hydra - Spetses or v.v..
G.A. Ferries Piraeus ( Athens ) - Patmos - Leros - Lipsoi - Nisyros - Kalymnos - Kos - Rodos ( Rhodes ) - Symi - Tilos - Anafi - Folegandros - Ios - Naxos - Thira ( Santorini ) - Paros - Sikinos - Ag.Kirikos ( Ikaria ) - Vathi / Samos - Fournoi - Karlovassi / Samos - Syros - Kimolos - Milos - Paros - Serifos - Sifnos - Chios - Mykonos - Kavala - Lesvos ( Mytilene ) - Tinos or v.v..
Volos (Magnesia) - Skiathos - Lesvos (Mytilene) - Limnos - Skopelos or v.v..
Ag.Con/tinos ( Agios Costantinos - Fthiotida ) - Alonissos - Skiathos - Skopelos or v.v..
Thessaloniki - Skiathos - Skopelos - Syros - Tinos - Mykonos - Naxos - Paros - Ios - Santorini (Thira) - Heraklion (Crete island) or v.v..
Heraklion (Crete island) - Kassos - Karpathos - Rodos ( Rhodes ) or v.v..
Heraklion (Crete island) - Santorini (Thira) - Naxos - Paros - Piraeus (Athens) or v.v..
Ag.Constantinos ( Fthiotida ) - Alonissos - Skiathos - Skopelos or v.v..
Piraeus ( Athens ) - Aegina - Poros - Spetses - Hydra - Kimolos - Kythnos - Milos - Serifos - Sifnos - Hermioni - Porto Heli - Methana - Mykonos - Syros - Tinos - Naxos - Paros - Ios - Thira ( Santorini ) - Folegandros - Sikinos - Katapola ( Amorgos ) - Anafi - Koufonissi or v.v..
Rafina ( Athens ) - Mykonos - Tinos - Andros or v.v..
Volos (Magnesia) - Alonissos - Glossa - Skiathos - Skopelos or v.v..
Ag.Constantinos ( Fthiotida ) - Alonissos - Glossa - Skiathos - Skopelos or v.v..
Heraklio ( Crete ) - Thira ( Santorini ) - Ios - Naxos - Paros - Mykonos or v.v..
Ionian Ferries Kilini (Kyllini) ( Peloponesse ) to Zakynthos (Zante) - ( Cephalonia / Kefalonia ) : Poros - Lixuri & Argostoli or v.v. Kallisti Ferries Piraeus ( Athens ) - Ag.Kirikos ( Ikaria ) - Evdilos ( Ikaria ) - Vathi ( Samos ) - Karlovassi ( Samos ) - Fourni, or v.v..
Lane Lines Piraeus ( Athens ) - Milos - Thira ( Santorini ) - Crete ( Agios Nikolaos & Sitia ) - Kasos - Karpathos - Diafani ( Karpathos ) - Chalki - Rodos ( Rhodes ) or v.v..
Piraeus ( Athens ) - Milos - Crete ( Heraklio & Sitia ) - Kasos - Karpathos - Diafani ( Karpathos ) - Chalki - Rodos ( Rhodes ) - Kastelorizo - Kos - Samos - Chios - Limnos - Lesvos (Mytilene) - Alexandroupolis. Minoan Lines Piraeus ( Athens ) - Crete ( Heraklio ) or v.v..
Nel Lines Piraeus ( Athens ) - Mykonos - Syros - Tinos - Chios - Lesvos ( Mytilene ) - Vathi / Samos - Thessaloniki or v.v..
Saronic Piraeus ( Athens ) - Poros - Spetses - Hydra - Porto Heli - Ios - Thira ( Santorini ) or v.v. SAOS Lines Lavrio ( Athens ) - Psara - Andros ( Gavrio ) - Ag. Eystratios - Limnos - Samothraki - Alexandroupoli or v.v. Kavala - Limnos - Lesvos - Psara - Lavrio or v.v. Alexandroupoli - Samothraki - Limnos - Lesvos ( Mytilene ) or v.v. Syros - Paros - Naxos - Folegandros - Ios - Sifnos - Kimolos - Milos - Thirassia - Thira ( Santorini) - Anafi - Lavrio ( Athens ) - Mykonos - Tinos - Chios - Lesvos ( Mytilene ) or v.v. Strintzis Ferries Kilini ( Peloponesse ) to ( Cephalonia / Kefalonia ) : Poros - Lixuri & Argostoli or v.v. Super Jet Piraeus ( Athens ) - Thira ( Santorini ) - Ios- Naxos - Mykonos - Syros or v.v. Ventouris Sea Lines Piraeus ( Athens ) Paros - Naxos - Ios - Thira ( Santorini ) - Donousa or v.v..
Zante Ferries Piraeus ( Athens ) Paros - Naxos - Ios - Thira ( Santorini ) or v.v..
you can also reserve International ferries from Italy to Greece or v.v.. Italy to Croatia or v.v.. from Italy to Albania , from Italy to Turkey or v.v.. For Italian domestic lines. From Greece to Turkey or v.v..
Ancona (Italy) - Corfu, Igoumenitsa, Patras (Greece) or v.v. Venice (Italy) - Igoumenitsa, Corfu, Patras (Greece) or v.v. Brindisi (Italy) - Corfu, Igoumenitsa (Greece) or v.v. Bari (Italy) - Durres (Albania) or v.v. Brindisi (Italy) - Avlona (Albania) or v.v. Ancona (Italy) - Igoumenitsa, Patras, (Greece) or v.v. Brindisi (Italy) - Corfu, Igoumenitsa, Zante [Zakynthos] (Greece) or v.v. Brindisi (Italy) - Patra (Greece) or v.v. Brindisi (Italy) - Corfu, Cephalonia, Zante, Igoumenitsa (Greece) or v.v. Venice (Italy) - Corfu, Igoumenitsa, Patras (Greece) or v.v. Ancona (Italy) - Igoumenitsa, Patras (Greece) or v.v. Bari (Italy) - Igoumenitsa, Patras (Greece) or v.v. Rosyth (Scotland) - Zeebrugge (Belgium) or v.v. Bari (Italy) - Corfu, Igoumenitsa (Greece) or v.v. Brindisi (Italy) - Cesme (Turkey) or v.v. Ancona (Italy) - Cesme (Turkey) or v.v. Kos island (Greece) - Bodrum (Turkey) or v.v. Rhodes (Rodos) island (Greece) - Marmaris (Turkey) or v.v. CROATIA Spalato - Hvar - Bol. a) To view ALL International Lines (Greece, Italy, Albania, Cyprus, Israel, Turkey) ferry schedules. b) If you wish to travel with your Minibus, Camper, Caravan, Boat trailer or Baggage trailer. c) To collect your tickets at the departure port without service fee and delivery charge (for International ferries only). Also There is a 4-days limit before an itinerary's reservation occurs. For some ferry connections within Greece you will need to have your ferryboat tickets in hand. This means that we have to send the tickets to your mailing address by Courier Service or Express Register Post (time permitting) with additional service charges. *Except the itineraries from Piraeus (Athens) to Crete ( Chania - Rethymnon - Heraklion ) or v.v. by ANEK LINES , MINOAN LINES , G.A. FERRIES , HELLENIC SEAWAYS , BLUE STAR FERRIES , NEL LINES , AEGEAN SPEED LINES , EUROSEAS , SEA JETS , A.N.E.S , VENTOURIS SEA LINES , AGOUDIMOS LINES , CYCLADES FAST FERRIES , DODEKANISSOS LINES , KALLISTI FERRIES , LANE LINES to Greek islands you can collect your tickets at port without any EXTRA CHARGE. We will provide you with a Reservation code and your Ticket number after your booking has been processed. For Domestic lines click here! For international lines click here! In this field are listed all itineraries (one way - return or multi leg [with the same company] ). View which ferry companies operate the trips and also Vessel name, Departure & Arrival date ant time. Choose the desired departure(s)* and press "Continue". * Attention: If you want to return from another port, island or use another company, please fill out a new booking form, without selecting delivery method. In this step online booking system informs you about the available accommodation classes in your preferable route(s). 2-bed, 3bed, 4-bed cabins are separated in male and female unless you want to book it all for your family. After filling in the form for the 7th, 8th etc passenger, please do not mark on "delivery method", So you will not be charged again for the postage expenses. (All the above must be done on the same day, because your tickets are posted immediately). Bellow you can Find types and description details of accommodation classes. See the cost of the reservation you made. Fill in the fields with passengers' data (up to 6 people) and vehicles (if you have) details. Here you can see the total amount that your credit card will be charged for. Tickets cost and Service fee. *Postage expenses depend on the way of delivery that you will choose, Click on the desired tickets delivery choice. * Check if you have provided us with your correct full address. * Re-confirm it when you receive our confirmation message. Pressing "Book Now" will convey you to the Secure Server of Eurobank for your on-line payment with your credit card. Fill in the form with your credit card data to finalize the reservation. After then you receive a confirmation message by email, If you don't, contact us booking@ferries.gr as soon as possible. After then we proceed with the ticket(s) issue and delivery. provide T.O.D. (Ticket on Departure) ticketing. You may pick up your tickets at the ferry companies' port / harbour check-in Offices without paying delivery expenses. We will provide you with a Reservation code and your Ticket(s) number after your booking has been processed. Also you can collect your tickets at your mailing address by Courier Service or Express Register Post (time permitting) with additional service charges. 5, 25th August Str, 71202, Heraklion, Crete island, Greece. After filling in the form for the 7th, 8th etc passenger, or the new route, please do not mark on "delivery method", So you will not be charged again for the postage expenses. The Bank offers the Verified-by-Visa and Mastercard Secure Code services authorized by the International Visa & Mastercard Organizations, in order to double-secure your on line-transactions made by credit cards. These services protect you when you transact online, from potential malicious use of your information, because it requires the use of personal secret password, which you enter during your online shopping. This way is electronic control of data in order to complete your transaction with the maximum safety. All valuable and personal bank information during your transaction is encrypted with an SSL 128bit protocol. Paleologos s.a. is Certified according to the international safety standard Payment Card Industry Data Security Standard (PCI DSS). The PCI DSS was created by the International Organizations Payment (VISA, MasterCard, AMEX, Discover/DINERS, JCB).